We believe that good health is at the heart of all human development; it enables children to thrive, women to succeed, families and communities to prosper, and countries to grow their economies. Regardless of where they live, all should have access to quality, affordable and reliable essential healthcare services; no one should have to forgo treatment or be forced into poverty because of the cost of care. This philosophy underlies our support for the global Universal Health Coverage (UHC) movement. Championed by the World Health Organization (WHO) and promoted by governments worldwide, efforts to achieve UHC are a global priority. They are also a central element of the UN’s Sustainable Development agenda and its Goal 3: healthy lives and well-being for all at all ages. The need is great. According to the 2017 Global Monitoring Report from the WHO and the World Bank, half of the world’s population lacks access to essential health services.25 Moving toward UHC requires a diverse group of stakeholders, including governments, NGOs and the private sector, to invest in creating and unlocking capacity to deliver care. At Johnson & Johnson, we are firmly committed to doing our part to ensure that the promise of UHC becomes a reality. While our primary role as a private-sector stakeholder is to continuously innovate and deliver transformational products and services to those in need, we also have an opportunity to help shape broader system-level solutions that promote UHC. We support the WHO position that there is no one-size-fits-all approach to how UHC is delivered.26 Around the world, we have hundreds of health-related programs, and we strive through these to align with government priorities and advocate with both local and central governments for quality healthcare, especially for women and children. We believe that tailored strategies that align local needs, resources and market conditions must be part of the solution. Health workforce and infrastructure: A robust heath system with well-trained and well-equipped health workers is foundational to delivering UHC. We have a legacy of working to support the people who are at the front lines of delivering care. For more information, visit Supporting the Frontlines of Healthcare. Access and affordability: At Johnson & Johnson, we have a responsibility to make our medicines, vaccines, devices and diagnostics accessible and affordable to people in traditional reimbursed healthcare markets, emerging economies and developing countries. Ensuring access to innovative products not only helps individual patients, but can also free up health system resources to treat other issues. We also utilize mHealth programs to encourage key populations, like expectant mothers, to access care in existing health systems. For more information, visit Access to Healthcare. Sustainable financing: Ensuring UHC does not mean that provision of care must be free or that a single-payer system is the best or only solution, but it does require sustainable financing systems for those both providing and needing care. We support investments in value-based care that ensure patients and health systems are spending their money on effective solutions. To read more, see Shifting to Value-Based Care. Partnerships: While governments often play a leading role in building health systems and financing and/or delivering care, the inherent complexity of healthcare means no one sector can effectively deliver on the promise of UHC. The public, private and non-profit sectors have a shared responsibility and accountability at the global and local levels. Leveraging our size and skills, Johnson & Johnson has placed an emphasis on innovative R&D partnerships that aim to move beyond treating diseases to intercepting or preventing them in the first place. For more information, visit World Without Disease. Each initiative offers us learnings and insights, which we work to refine and apply in our tailored engagements by market. 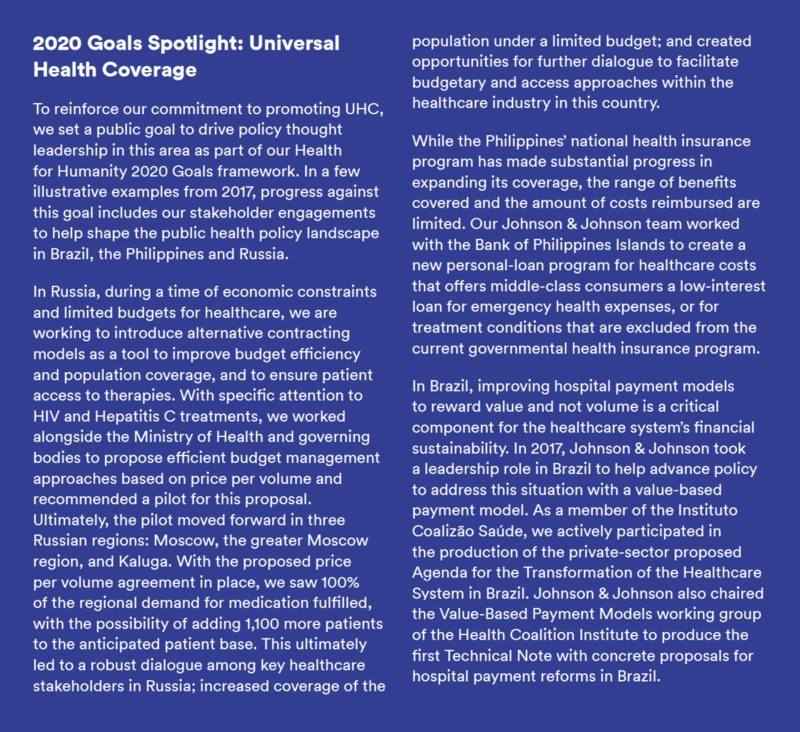 For more information on our commitment to and perspective on UHC, see Universal Health Coverage Policy Statement. Drive policy thought leadership and strategic engagements to expand healthcare access and coverage in at least three emerging markets (including Brazil, China and India), and lead three to five pilots to demonstrate the results of these efforts. More than 700 engagements conducted with government officials and other partners in Brazil, China and Mexico. Ongoing and new pilot projects being implemented in China, Mexico, Philippines, Russia and Thailand.